Now we turn our attention to prenatal development which is divided into three periods: the germinal period, the embryonic period, and the fetal period. Here is an overview of some of the changes that take place during each period. The germinal period (about 14 days in length) lasts from conception to implantation of the zygote (fertilized egg) in the lining of the uterus. During this time, the organism begins cell division and growth. After the fourth doubling, differentiation of the cells begins to occur as well. It’s estimated that about 60 percent of natural conceptions fail to implant in the uterus. The rate is higher for in vitro conceptions. This period begins once the organism is implanted in the uterine wall. 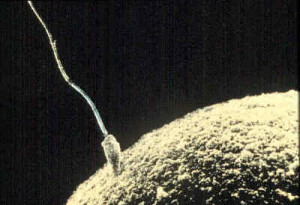 It lasts from the third through the eighth week after conception. During this period, cells continue to differentiate and at 22 days after conception the neural tube forms which will become the brain and spinal column. Growth during prenatal development occurs in two major directions: from head to tail (cephalocaudal development) and from the midline outward (proximodistal development). This means that those structures nearest the head develop before those nearest the feet and those structures nearest the torso develop before those away from the center of the body (such as hands and fingers). The head develops in the fourth week and the precursor to the heart begins to pulse. In the early stages of the embryonic period, gills and a tail are apparent. But by the end of this stage, they disappear and the organism takes on a more human appearance. About 20 percent of organisms fail during the embryonic period, usually due to gross chromosomal abnormalities. As in the case of the germinal period, often the mother does not yet know that she is pregnant. It is during this stage that the major structures of the body are taking form making the embryonic period the time when the organism is most vulnerable to the greatest amount of damage if exposed to harmful substances. (We will look at this in the section on teratology below.) Potential mothers are not often aware of the risks they introduce to the developing child during this time. The embryo is approximately 1 inch in length and weighs about 4 grams at the end of this period. The embryo can move and respond to touch at this time. From the ninth week until birth, the organism is referred to as a fetus. During this stage, the major structures are continuing to develop. By the 12th week, the fetus has all its body parts including external genitalia. In the following weeks, the fetus will develop hair, nails, teeth and the excretory and digestive systems will continue to develop. 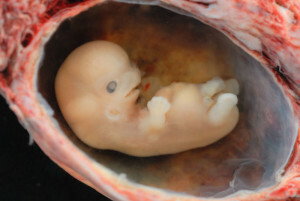 At the end of the 12th week, the fetus is about 3 inches long and weighs about 28 grams. During the 4-6th months, the eyes become more sensitive to light and hearing de, hearing develops. Respiratory system continues to develop. Reflexes such as sucking, swallowing and hiccupping develop during the 5th month. Cycles of sleep and wakefulness are present at that time as well. The first chance of survival outside the womb, known as the age of viability is reached at about 22 and 26 weeks (Moore & Persaud, 1998). Many practitioners hesitate to resuscitation before 24 weeks. The majority of the neurons in the brain have developed by 24 weeks although they are still rudimentary and the glial or nurse cells that support neurons continue to grow. At 24 weeks the fetus can feel pain (Royal College of Obstetricians and Gynecologists, 1997). Between the 7th and 9th months the fetus is primarily preparing for birth. It is exercising its muscles, its lungs begin to expand and contract. It is developing fat layers under the skin. The fetus gains about 5 pounds and 7 inches during this last trimester of pregnancy which includes a layer of fat gained during the 8th month. This layer of fat serves as insulation and helps the baby regulate body temperature after birth.